Its a safe way to cross the road; its not a shelter. 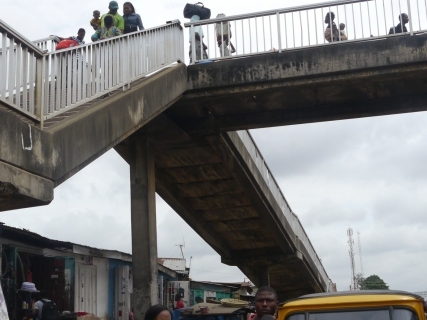 So Nigerians can make use of pedestrian bridge? This time around though it was used as shelter from the rain. As I walked in the drizzles (the rain caught me halfway through my wakawaka) to navigate the Ojota bridge as is my usual practice, I found a number of people on the bridge, then I thought to myself, it is quite interesting to see that Nigerians could find one usefulness of bridges! hian! The earlier we started doing things the right way, the better for us. Change is the only constant thing!